Another Wednesday and another opportunity to thank Allison Gingras and Elizabeth Riordan for their weekly invitation to re-post our favorite articles on Worth Revisiting. His early years – On January 1, 1526, one hundred and seven years after the death of St. Vincent Ferrer, another Dominican saint was born in Valencia – St. Louis Bertrand. He was actually baptized in the same Church and font in which St. Vincent had been baptized. Louis’s father, John, was related to and had an ardent devotion to Saint Vincent. He passed that devotion to his son – one which Louis treasured throughout his life. His entry into the Dominican Order – Louis was certain he would save his soul as a Dominican, but his father objected to his joining the Order, believing he was better suited for the Carthusians. His father acquiesced only after Louis told him he would rather die than leave the Order. 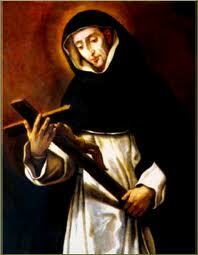 He made his Dominican profession on August 27, 1545. Louis expected his novices to frequently confess their sins. He so valued this Sacrament that he would go to confession two or three times a day. His inability to do so during the time he later spent in Latin America was the heaviest cross he had to bear as a missionary. One of the major reasons for all of Louis’s fasts, disciplines, and prayers, and for all the penances he inflicted on his novices was to save him and them “as far as possible, from the penalties of Purgatory”. (Wilberforce 70) This urgent concern was no doubt reinforced after the soul of his father (a man who with human eyes seemed to have lived a holy and virtuous life) appeared to him over an eight year period, begging Louis to pray that he would be delivered from the pains of Purgatory. Missions – In 1562 Louis left Valencia for Carthagena, New Granada (in what is now the country of Columbia) hoping to be a martyr for the Faith – a crown he was not to receive. Instead, God used him to convert thousands of souls and to advocate for the humane treatment of the native Indians who were so frequently abused and mistreated by Louis’s fellow countrymen that Bishop Bartholomew de las Casas (himself a Dominican) insisted that priests withhold absolution from those who did so. For his first three years, the convent of St. Joseph in Carthagena was the base for his missionary trips. He joyfully accepted the dangers and rigors of travel by foot through tropical jungles and mountainous terrain, carrying no food or water but only a little bag, containing a Bible and his Office. However, Louis quickly came to understand that his inability to speak the native languages impeded his effort to save their souls. He asked God “for the same gift of tongues for which St. Vincent Ferrer was so much celebrated, and by means of which he converted such multitudes to God.” (Wilberforce 154) The Lord answered his prayers. He and the Indians could understand each other. Thousands of them converted. His superiors next sent him to Tubera, where his holy example, zeal for souls and the “penetrating power of his words” resulted in the conversion of its more than 10,000 inhabitants. Three years later, Louis went to Cipacoa, an area which had been experiencing a severe drought for some time. Louis promised the residents that if they constructed an altar upon which he would say Mass the following morning, the drought would end. They did and the rains came. Many were converted. He next visited St. Martha where he “instructed and baptized as many as 15,000 persons”. (Wilberforce 185) While there, he heard of the nearby Caribbee Indians, who had a superstitious veneration “to the bones of a defunct idolatrous priest” believing that “if any one removed them from the place in which they were worshiped, the sky would immediately collapse”. (Wilberforce 192) Despite his best efforts, Louis was unable to stop this practice so he secretly removed the bones, hoping when no catastrophe occurred that the Indians would abandon their practices and be open to the Gospel. As he continued his missionary journeys, he found many natives dying in large numbers from some unknown pestilence. He went from house to house “sprinkling the inhabitants with holy water and blessing them with the sign of the Cross”. (Wilberforce 211). No one he so blessed died. At another point in his travels, he raised a young girl from the dead. The friars of the Convent of Santa Fe de Bogota thought they could prevent the Saint from leaving their country by electing him their Prior, but the Master of the Order commanded him to return to Spain. On the voyage home, fierce storms so severely damaged the boat’s sails and rudder, that all on board save Louis feared death was imminent. Louis calmly made a sign of the cross and commanded the sea to be still. It complied. Not wanting to bring any attention to himself, Louis hid. The violent storm returned. The crew begged Louis to intercede again. He made another sign of the cross and the serene seas returned. There were no further storms and the ship with its precious saintly cargo arrived in Spain on October 18, 1569. Life in Spain – Louis was allowed to remain secluded in his convent without any formal office for a year. He was then elected Prior of St. Onuphrius – a small convent without many financial resources, in disrepair, heavily in debt, and with few religious. He did not want this position, did not feel qualified for it and sought to be excused. Permission was denied. Ever obedient, Louis assumed his duties as Prior and went about transforming the convent, physically, financially and spiritually. Vocations flourished. Spiritual Discernment and Zeal for Souls – Louis was able to discern the condition of souls and used this gift for the spiritual advancement of those who sought his counsel, often telling priests and lay penitents alike what they needed to or had forgotten to confess. Individuals conscious of unconfessed sin often avoided him until after they had availed themselves of the Sacrament of Confession. Once Louis approached two men who gave public scandal by openly living with a woman to whom they were not married. He spoke to them individually and privately, but failed in trying to have them recognize and repent of their sin. He then preached publicly in general terms of this type of sin without mentioning these specific men by name. When both obstinately persisted in this grave and public sin, Louis reprimanded them by name from the pulpit. One of them immediately attempted to attack the Saint but was stopped “by the sight of flames of heavenly fire surrounding and defending” the priest. (Wilberforce 263) He fled from the Church, returned home and told his lover what had just happened. She, not he, ran back to the Church and publicly sought forgiveness and reconciled with her Lord. The other gentlemen waited for a time until he found the Saint standing outside the Church. Louis knew this man was intending to kill him, but instead of safely entering the Church to escape from him, he smiled “kindly on his enemy and asked if he could do him any service”. (Wilberforce 264) This fearless act so touched this man’s heart that he got off his horse, knelt before Louis and begged pardon for his scandalous life. Final days – After his term as Prior ended, Louis was finally able to enjoy the solitude of his cell where his prayer became more prolonged, his penance more rigorous, and his humility more profound. He died in Valencia on October 9, 1581 and was canonized by Pope Clement X in 1671. So effective was Louis in the formation of the novices entrusted to his care that St. Theresa of Avila asked for his advice as she sought to reform her Carmelite order. He is the patron saint of novice masters and mistresses and novitiate brothers and sisters and is often referred to as “Preacher to the Indians”.